1996 – All thirteen-year-old Lenni wanted to do was walk to the store by herself to get an ice-cream. Her older sister, Claire thought it would be fine. Her parents were very overprotective. Lenni just wanted to have some of the freedom that Claire and her brother had. It was just a short walk ….what could possibly happen? 2017 – It has been twenty years since Lenni went missing from the beach. Claire is now married and has two children of her own. No one has forgotten Lenni but Claire has carried around a tremendous amount of guilt for letting her sister out of her sight that day. Claire’s father, Patrick has been diagnosed with Alzheimer’s and it seems to be getting worse. Her mother feels that it is time to sell the family farm. Claire is upset…they’d made a promise…. Someone must always be here…. Claire decides that since they are selling the farm they should have one last get together…a reunion. Her friends always loved her father and she’s sure that seeing everyone will cheer him up. The whole gang will be there….including everyone who was at the beach the day Lenni disappeared. But as more and more strange things start happening…suddenly the reunion that is meant to be a happy occasion….turns into a nightmare. This story is told from many points of view and did take some time to get going. However, I was really intrigued by the characters and their individual stories. Sometimes with that many characters and side plots, I can find it hard to connect and/or keep everything straight. But I really didn’t have a problem in this case. With each perspective, we were given little hints. I started to question everyone’s intentions and whether or not that they could have had anything to do with what happened all those years before. Once I hit the halfway point, things really picked up and I was engrossed in everything that was happening. I had my suspicions and was eager to see if I was correct or way off base. 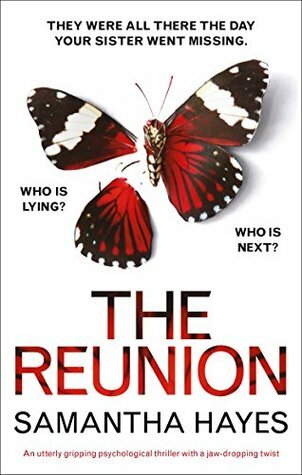 “The Reunion” was a story full of secrets, lies, and deception. There was a lot going on, but I found it gripping. I became invested in many of these characters and couldn’t wait to see what was going to happen next. This was a clever and twisted tale with many excellent red-herrings. I thought everything came together fairly well, although there were one or two things I could have used a little more clarification on. But overall, this was a satisfying psychological thriller that I really enjoyed. I look forward to reading more from Samantha Hayes! Many thanks to Bookouture and NetGalley for providing an advanced copy in exchange for my honest review. This book sounds so interesting, seems like my type of book! Thank you for the brilliant review! Excellent review, it sounds like a great read.. Thank you! I really did enjoy it. Happy reading! Great review! I kind of wish I had requested this one now. Good to hear you enjoyed it! Thank you! I have had that feeling too… so many great books. We are definitely spoiled for choice. I hope you’re enjoying what you’re reading now . I completely agree! I’m continuing with The Good Daughter right now, but afterwards it’s another bookouture read for me… The Visitor. 😉 Have a great weekend! This sounds super intriguing and it’s great that it ended up picking up. Awesome review! Glad to hear that you enjoyed this one. I did too. Fab review.